In Philadelphia, the 76ers can order yakisoba noodles for breakfast and drink bone broth during film sessions. It's all part of the team's food program under executive chef JaeHee Cho. When JaeHee Cho first auditioned for the executive chef job with the Philadelphia 76ers, he was going to wow the brass. He composed a menu titled "Chicken & Egg." He'd take four or five chickens and showcase every part of the bird -- use the bones to make a broth of incomparable depth, confit the legs and craft an elevated salad from the meat, concoct an East African-style stew by braising the thighs in a berbere spice, and even bake chawanmushi, a Japanese egg custard tart, three ways. Sixers president of basketball operations Bryan Colangelo received the suggested menu over email and winced. He appreciated Cho's ambition, but this might be a little bit too ... chefy. "I was looking to show off a skill set, and how I could use creatively every part of a chicken," Cho says. "but they were like, 'Can you make a good pancake?'" The Sixers countered by suggesting a meal that would start with basic breakfast items, then move toward crowd-pleasing lunch and dinner fare. Cho would also need to pay attention to the nutritional composition of the dishes because he'd ultimately be feeding world-class athletes. Inside a friend's brick-walled restaurant a couple of blocks off the Italian Market, Cho started Colangelo and a few other Sixers execs at around 1 p.m. with omelets featuring fresh produce, then brought out three kinds of pancakes: one from his own sourdough culture mix, another made with flaxseed milk, and a more traditional pancake made with buttermilk sourced from a local dairy. Over the next two hours, the plates kept coming. Beef fajitas were followed by grilled salmon skewers served with couscous. When the meal was over, Colangelo and company could barely move. 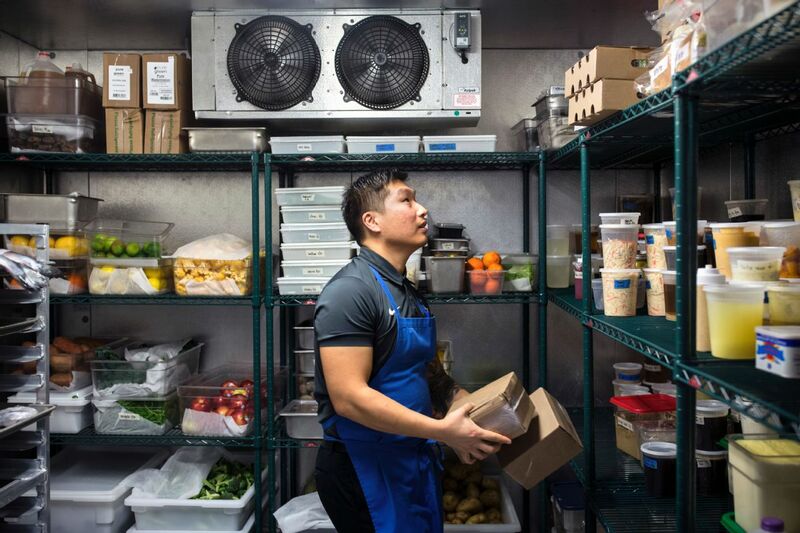 Pending a background check, Cho would become the executive chef of the NBA's most comprehensive, sophisticated and well-equipped food program. The NBA is living in a golden age of infrastructure -- gleaming new training facilities populated by cutting-edge sports scientists and space-age machinery, analytics departments larger than entire basketball operations departments were a decade ago and amenities that cater to seemingly every need of the modern NBA player. The Sixers have put food at the center of the team's daily existence. Situated on the second floor of the Sixers' training facility in Camden, New Jersey, the team's enormous, light-filled dining room and professional-grade kitchen with a view of the Philadelphia skyline function not only as a fueling station where players receive nourishment, but also a hub for the communal life of the team. 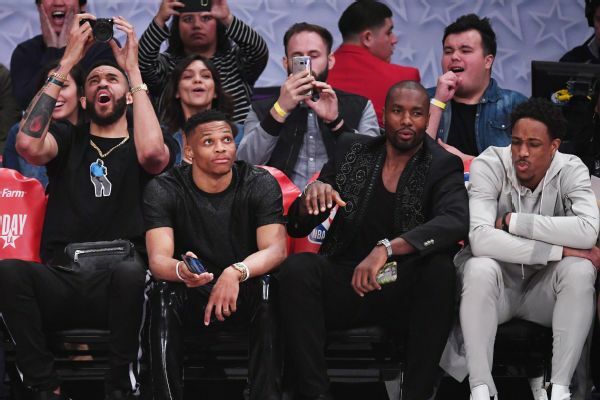 "It's always good to break bread with people, with your teammates," says Sixers wing Justin Anderson. "I've learned as much from my teammates in here or on the road at dinner or inviting them over. Food has been a great way over my career to get to know my teammates." The meals prepared by Cho, 34, and his team on game days power the Sixers. These athletes rely on Cho to deliver the goods specified in their individual nutrition programs, to make food that will sit well and will make them feel good, and to be discreet about their habits. It's an enormous investment of trust from players and from a franchise that has developed a taste for championship contention. Sixers shooting guard J.J. Redick calls Cho's operation, "a top-10 Philadelphia restaurant." Over four days in February, we embedded ourselves inside that establishment. The Sixers' front office is known not just for scouting top basketball talent, but also notable restaurants. They have plenty in their backyard, as Philadelphia has established itself as a foodie hub. General manager Bryan Colangelo, right, and assistant Ned Cohen dine at Zahav, whose chef, Michael Solomonov, took home the nation's most prestigious culinary award: the 2017 James Beard Award for Outstanding Chef. The Sixers first stumbled upon Cho when he worked at Parc Restaurant. Lists, reminders and the team's schedule hang in the Sixers' kitchen. Much of the planning occurs when the team hits the road. "That's when much of the R&D happens for the next set of menus," says Cho. "There's constant reworking and reorganization of what we do. There are a lot of ideas, and we only really have time to test them out when the guys are away." Cho, left, talks with Sixers guard Timothé Luwawu-Cabarrot during breakfast time. Cho and his team generally get to the kitchen between 6 and 6:30 a.m. on most game days and between 7 and 7:30 a.m. on practice days. On the morning of Feb. 12, the breakfast spread consisted of scrambled eggs, sweet potatoes with harissa, buttermilk pancakes and chicken-sausage patties made in-house. Cho works with local farmers and purveyors to find the highest-quality and most sustainable dairy, produce and proteins. Eggs come from hens in nearby Gap, Pennsylvania, while rutabaga might be supplied by a farmer in south New Jersey. "Where food comes from and how it's grown and the care into raising livestock or tending the soil, I feel like that has a direct effect on the wholesomeness and nutritional content of food," says Cho. Sixers shooting guard J.J. Redick eats breakfast on Feb. 13. "I've been overly impressed," Redick says of the Sixers' food program. "I tell the younger guys on the team -- this is all they've known -- this is so rare in the NBA, to have a real chef and a team of people that is working solely to provide you with high-quality meals, it's incredible." Redick generally utilizes the buffet spread in the dining room, but on game days, Redick requests beets -- and has been an ambassador for the often misunderstood veggie, which has caught on among his Sixers teammates and the team's staffers. "Our trade deadline was fueled by beets," says Zachary Sogolow, the Sixers' associate coordinator of basketball operations. Sixers center Amir Johnson consults with sous chef Ilissa Shapiro before selecting a beverage for breakfast. Shapiro, who, like Cho, came from Parc Restaurant, also has a background in physical therapy and majored in kinesiology at Penn State University. With the Sixers, she runs point on pastry and baking. Sous chef Max Botwick prepares a batch of fresh smoothies, which are one of many grab-and-go options available throughout the day in the commissary. Jeanie Subach, a registered dietitian who has been advising the 76ers since 1989, performs a nutrient analysis on Cho's recipes and works with him to ensure that the components work within the teams' health profiles. "But we don't force food on anyone," Subach says. "We help athletes make informed decisions, and one of the best ways to do that is giving them healthy food that tastes good." Luwawu-Cabarrot leaves the dining room after lunch. Though creating a space to build camaraderie wasn't a primary motivation for a team that already spends plenty of time together during a long NBA season, the dining room functions as a family room for the Sixers. "Guys will sit there, eat, talk and tell you about what they've got planned for the day," says Sixers forward Robert Covington. "It's a relaxing place to be as a team that isn't the locker room." Sixers guard T.J. McConnell chats with chef de cuisine Rob Marzinsky, left, after finishing breakfast. The chefs particularly enjoy cooking for McConnell "because of that feedback loop," says Cho. "He'll tell you why he liked a dish, and he'll be excited about it. It's like having a dinner party and having a guest who will come and look at all your food and understand the work that went into it." Sixers guard Justin Anderson prepares to take a jumper during morning shootaround on the Sixers' practice court. Anderson likes a more interventionist approach from Cho & Co. "One of my biggest issues used to be portion control," says Anderson. "Because of the way I was brought up, if it's on my plate, I'm going to eat it. I told Jae, 'I'm giving you the freedom to take control and coach me and challenge me every day to only have a certain portion and make me not go back for seconds, and to make me take 30 minutes after a meal to let it digest and realize, 'I feel good and I'm not hungry anymore.'" A whole salmon is pictured before being butchered by Cho. Salmon is a high-usage protein in the Sixers' kitchen. "It's a great product to work with because it's really versatile and a good source of healthy fats like Omega 3. It cooks in a way that's pleasing to eat, and doesn't have overt oiliness or 'fishiness' of a cod or mackerel." Jesse Wright, director of performance science, pours bone broth for players to drink on Feb. 13. Bone broth consumption has become a fixture during the team's morning film sessions. "You feel like it's a holiday when you smell the bone broth during film," says Sixers coach Brett Brown. "It's tasty and purposeful and part of what we do." Lisa Hsu, left, an NBA reporter for the Chinese digital network Tencent, and Cho show Sixers All-Star Joel Embiid how to make dumplings while filming a video feature for the Lunar New Year at the Sixers' training complex. "It was pretty cool to see how delicate Joel was with those dumplings," Cho says. "Even for a regular-size hand, it takes dexterity to fold it over and close it up with the filling. Joel watched once and he immediately picked it up." Amir Johnson loads up a plate for lunch to take into a team meeting on Feb. 13. "For me, accessibility has been the steepest learning curve," says Marzinsky. "You learn how to distinguish between restaurant food for the ideal diner who's looking for a certain experience and home food for players, who might want or need something else on the day of a game." Cho writes Embiid's name on a bag containing his game-day lunch to take home. "I'd love to look back 15 years from now, and if I'm still with the team or still working in the sports world, to see a guy that we fed and we educated and now after he's retired, he's continuing that mission and all those things," says Cho. Players vary in their taste, and some are devoted to a specific kitchen creation. Each morning, Sixers guard Jerryd Bayless eats yakisoba -- a stir-fried dish with alkaline buckwheat noodles and vegetables. The Sixers' Dario Saric (9) goes for a layup and is fouled by the Knicks' Enes Kanter during a game at the Wells Fargo Center in Philadelphia. By offering players such an all-inclusive food program, the team spares its players from having to spend time and thought foraging for food. "That takes time," Redick says. "It's 45 minutes or an hour of your day that you can spend doing something else because good, healthy food is readily available." Marzinsky prepares pierogies for McConnell, who notched his first career triple-double the previous night in the Sixers' win over the Knicks. The individual achievement warranted a plate full of savory, European-style dumplings for the Pittsburgh native. Sixers players McConnell (not pictured), Saric and Luwawu-Cabarrot dine at Double Knot restaurant in Philadelphia with their significant others. The trendy, all-purpose spot downtown turns into an upscale Izakaya after dark in the basement, a popular destination for the Sixers' collection of international players and savvy vets, who love the hot skewers off the robata. Skills, thrills and windmills -- what an All-Star Saturday night it was! 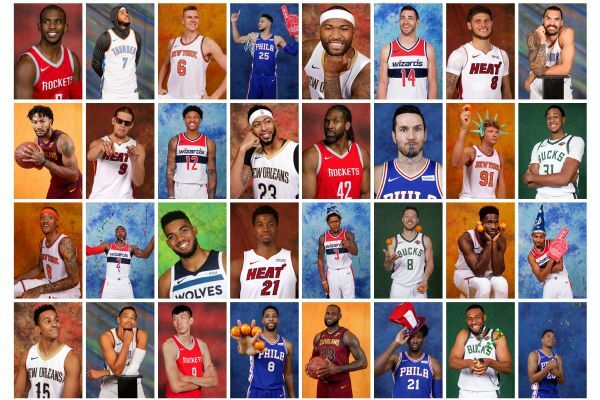 See NBA stars strike their best yearbook poses during picture day. 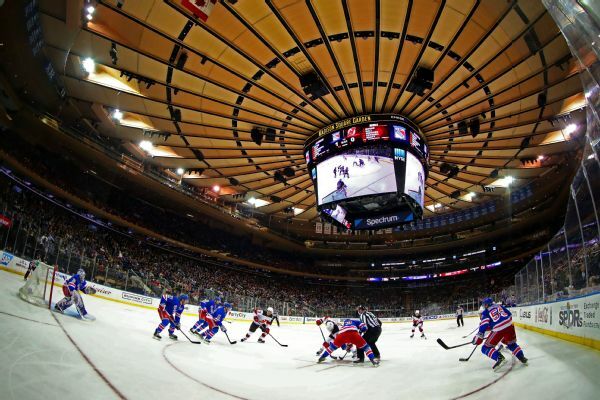 Get an inside look at MSG when it hosts three sports in one day. 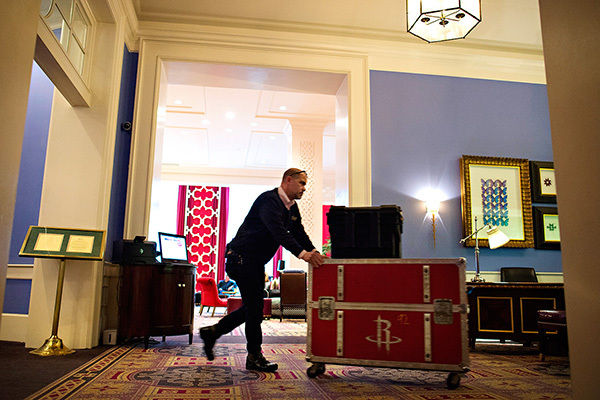 Welcome to an NBA hotel that caters to teams on the road.